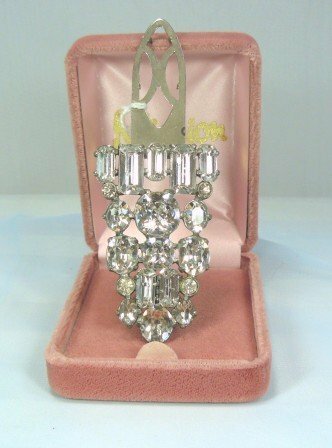 This elegant piece came from the estate of the lady who loved beautiful things and was able to collect avidly for years. There were a number of Eisenberg pieces there and this clip looked quite at home with the rest of them. It is not signed but it certainly has the impeccable "breeding" that one associates with Eisenberg designs. It measures 2-1/2" in length and is 1-1/2" wide and is made of large oval round and baguette cut rhinestones that still have their fiery brilliance. The dress clip on the back is still new looking; there is a bit of a string tag still on it. It came in a lovely mauve velvet box from Mission Jewelers; there is no way of knowing whether they were always together (the other Eisenberg pieces didn't have boxes, oddly enough). The box will come with the clip; they look like they belong together. With the bit of string, it makes you wonder if it's been worn, or was just tucked away somewhere. The back is a mixture of open and closed back settings for the large rhinestones; all the large ones are prong set. The only stones that seem not as sparkling as the larger ones are the 4 smaller chatons, depending on the way the light hits them. All in all, it is an impressive clip designed in the style of an era where the dress clip was an integral part of a lady's wardrobe. Eisenberg started signing their jewelry...and the rest, of course, is history. I haven't been able to find a similar piece to this in any of my reference books or on line, so any further help (hopefully) will come from someone who knows more than I do. For the time being, let's just say that this is a totally spectacular dress clip, in the Eisenberg style, probably from the 1930's-40's eras, that has kept all its glamour intact. It's ready for a new home and a chance to shine again...for years to come! *Golden Yellow Lucite Bangle Bracelet with a Lovely Sheen of Its Own! Vintage Japan Blue Willow Small Dish/Ashtray w/"Who Burnt Our Table-cloth?"